Real Estate SEO requires special expertise to get great results. The number of listings on a real estate website can be substantial. Getting top rankings on both short-tail and long-tail keywords is the key to success. Go2marK is a Real Estate SEO Expert in Las Vegas that will help your real estate agency in every step of the way. Before taking on your Real Estate SEO project we determine what your goals are. Would you like top rankings in search engines such as Google, Bing and Yahoo!? More visitors? Or a higher number of conversions? 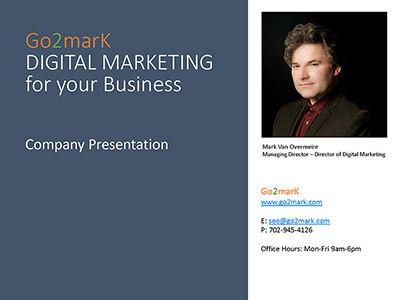 Go2marK ensures that your Real Estate website is fully search engine friendly and that your SEO goals can be reached. What are the benefits of working with a Real Estate SEO Expert? We can add MLS listings on your Real Estate website. Having MLS listings will create a big boost in your Real Estate SEO results. Don't own a Real Estate Website? No problem. If you do not have a website we can design and host a complete SEO friendly Real Estate website with all the required functionalities for you that looks fantastic on all devices. WordPress and Drupal are just some of the open source content management systems (CMS) we work with to design and manage a Real Estate website. Questions about our Real Estate SEO services?